CHICAGO, Aug. 8, 2018 /PRNewswire/ -- ForeverCar, the first digital platform for extended car repair coverage, announced today that it was honored with two IT World Awards®. 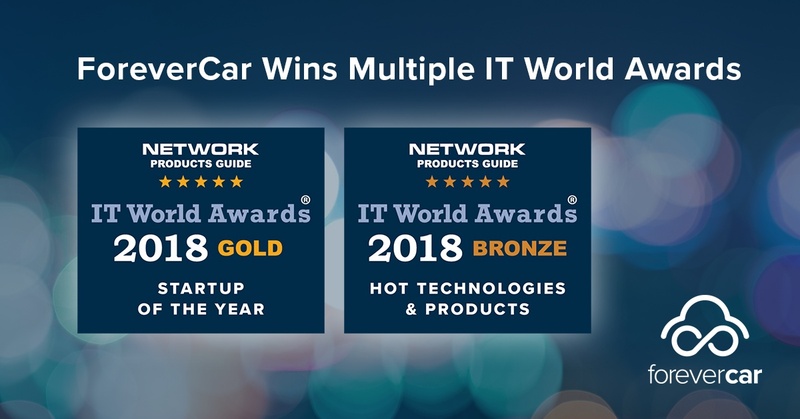 Network Products Guide, the industry's leading technology research and advisory guide has named ForeverCar a Gold Winner for Startup of the Year and a Bronze Winner in the Hot Technologies and Products category. "It's an honor to be recognized with multiple IT World Awards," said Mark Hodes, Founder and CEO of ForeverCar. "Our mission at ForeverCar is to transform an industry with innovative products and services. Receiving independent validation from such a prestigious organization is a testament to the talented team we've assembled and a clear indication that we are succeeding in our mission." The 13th Annual 2018 IT World Awards are the premier information technology awards honoring achievements and recognitions in every facet of the IT industry. Winners were honored in San Francisco on Monday, July 30, 2018 during the annual SVUS Red Carpet Awards Ceremony Dinner attended by the finalists, winners, judges and industry peers. ForeverCar's unique platform powers vehicle repair plan transactions on behalf of key partners in the automotive dealership, insurance and financial services categories. ForeverCar makes it simple for consumers to quote, shop, purchase and use vehicle service plans, while offering full transparency along the way. ForeverCar's innovative platform makes it simple for partners to sell high-quality vehicle service plans to their customers. Check out how ForeverCar is revolutionizing the car repair experience and putting you back in the driver's seat with the largest online vehicle repair plan marketplace, visit https://partners.forevercar.com or email us at media@forevercar.com.